Matthew Augustine (pictured right) of BioDrill, Inc. was running another business when he decided he wanted to do more than just generate revenue—he wanted to make an impact. 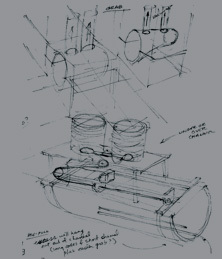 That’s how his product line, BioMass Energy Solutions, was born. The company has created hands-on lab kits (shown below) for use in a classroom setting. The kits help students understand anaerobic digestion, which is the process of converting organic waste into fuel. 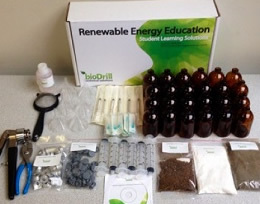 With these kits, BioDrill hopes to provide high quality learning tools for classrooms, students, and teachers. In order to do that, Augustine and his team have used takeaways from Pre-Seed Workshop to get input from potential customers and buy-in from investors. “I learned how important it is to understand our customers and the value we are bringing to the field,” Augustine said. The BioDrill team communicates directly with potential customers to ensure they are addressing their needs and wants. Through this process, the company’s product line has undergone some major developments since Augustine attended PSW in October 2013. The funding for these developments has come from both grants and private investors, with which Augustine said PSW helped. “The presentation we put together at the workshop gave us a nice template to present to investors,” he said. “Getting feedback on our product and presentation was essential in preparing for that.” Overall, BioDrill has raised $225,000 in outside investments. That’s just from private investors, and doesn’t include the several grants that have been awarded to the company.